1.In cocktail shaker or glass, muddle raspberries, mint leaves and simple syrup. Add bourbon; stir well and strain into a julep or cocktail glass filled with ice. Garnish with mint sprig and raspberries. 1.In cocktail shaker or glass, muddle blueberries, basil and simple syrup. Add ice, vodka and lemon juice; shake and strain into Collins or tall, narrow glass filled with ice. Top off with club soda; garnish with basil leaf and blueberries. 1.In cocktail shaker or glass, muddle strawberries, tarragon and simple syrup. 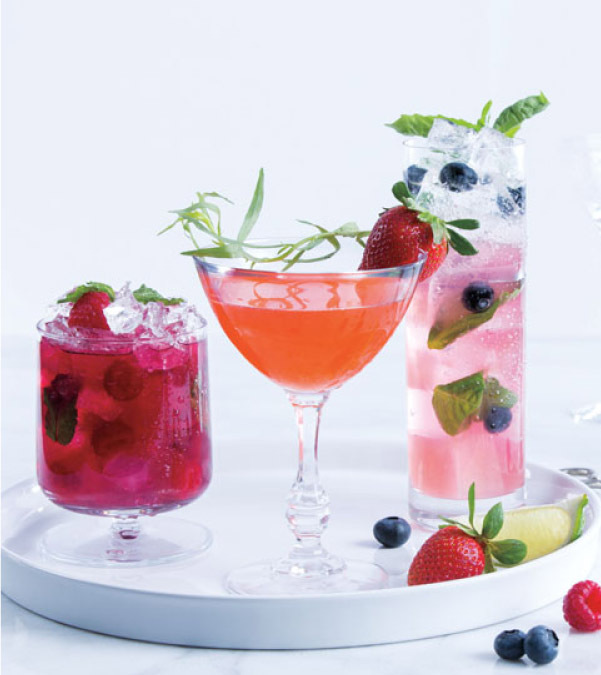 Add ice, gin and lime juice; shake and strain into coupe or sparkling wine glass. Garnish with tarragon sprig and strawberries. Stir a 1:1 ratio of sugar to water in a small saucepan (i.e., 1 cup sugar to 1 cup water). Heat the sugar mixture just to boiling, then reduce the heat and let it simmer until the mixture is clear; do not stir. > To muddle the drinks, use a muddler – a long stick similar to a pestle used to mash fruits, herbs and spices in the bottom of a cocktail shaker or glass.